We have moved - please help me spread the word! It is all change here at Snapdragon. Our challenge this year is to let as many people as possible find out about what we do - for I am very, very proud of what we do. This summer the textile side of the business will be 10 years old - I want this year to be the year that we really fly! So please help me spread the word. It is almost that time of year again - the day when we celebrate all our Dads and Grandads is fast approaching. 15th Junethis year! Handmade cards are always the best - but sometimes it is good to have a bit of a design to start you off. I designed this card last year as a freebie for our newsletter subscribers and it was so popular that I decided that this year I would put it up on the main site as part of our "Free things to make and do". I have also added in a Grandad option this year too. You can order and download it from the Father's Day department here - then all you have to do is print the PDF onto paper and card and let your artistic side flow . . . .
We would love to see how you get on - email a photo of your card to Jane@snapdragononline.co.uk and we will post the best on our Facebook page. There may even be a prize . . . I have 2 teenage daughters, aged 16 and 13. Over the past year the main point of conflict in our home isn't clothes or homework - it is vitamins. Their new found reluctance to eat vegetables (they ate them without a fuss as small children), combined with a seeming fear of going outside (where there is no wifi) have me stomping about the house declaiming about shingles and immune systems in a very "aged P" manner. I don't like the image that conjures up, so this quick and easy to make soup has become my secret weapon. It is all things green and vibrant whizzed up so that nothing can be "picked out. It is known in our house as "green soup" - as the actual ingredients change from month to month - but I prefer to think of it as "vitamin central". 2-3 handfuls of any of the following - ideally you want a mix - parsley, nettles, spinach, mint, chard, sorrel, coriander roughly chopped. Cook the onions in the butter or oil until soft and translucent. Add in the greens in batches and stir so that they get coated in the oil and begin to wilt. Add in the stock and bring up to a simmer - cook for 5-10 minutes until all the greens are tender. Whizz up in a blender or with a whizzy wand until as smooth as possible. Serve and stir in a swirl of natural yoghurt to each bowl. "Oh Britain doesn't make anything any more" - that is one of the things I am so fed up with hearing at networking events and dinner parties. There is a feeling that Britain's proud manufacturing tradition has dwindled past rescue. But of course Britain makes things, in the nooks and crannies of our country there are mills, factories and printing workshops carrying on against the odds - it is just more expensive to buy them than to ship in from other countries with lower labour costs. What you are paying for when you buy British is local jobs, health and safety, proper working conditions. You are paying to allow the people who make things to live a fulfilling and civilised life. One of the things that I am most proud of is that Snapdragon has created jobs - giving people meaningful, enjoyable, work and contributing to the UK economy are right at the top of our list of priorities. 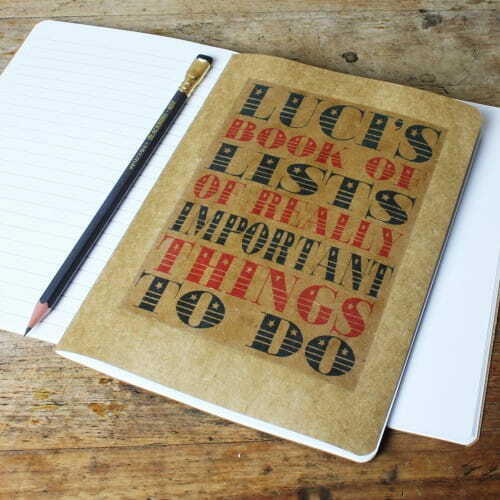 We have always worked with UK producers - our cards, postcards and notebooks are all made by small producers based here. The wool, linen and velvets that we use are woven in Great Britain. But, due to costs and minimum orders, we have always sourced our textile blanks from UK companies who bring them in from the Far East. So the most important of this year's Snapdragon projects is a plan to work with UK textile manufacturers to come up with new products which will be made from British fabrics in British factories. I am very excited to close the loop. Over the next few weeks I shall be on a "Make it British" road trip - touring little factories and chatting to people who still make things in Britain and working with them to come up with new things to add to our range. I would love to know what you think we should be doing and would love it if you would fill in our 3 question survey. If you fill in your email at the end we shall send you a thank you gift. I no longer eat sugar or wheat so I had been wondering what I would possibly do with all our beautiful home grown rhubarb now that crumbles and pies are off the menu. Then I came across various soup recipes which use rhubarb to cut through the sweetness of root vegetables. - This is my take on them - a soup which went down well at a family lunch yesterday - eaten by octogenarians and teens alike! It is an unusual soup - really savoury, sharp and light. Rhubarb, carrot and ginger soup. Fry the onions and garlic gently in the oil until soft. Add in rhubarb, carrots, ginger, cumin and coriander and cook for 5 minutes - do not allow them to colour. Add stock and simmer for 15 minutes until vegetables are soft. Add coconut milk and whizz it all to a puree either in a blender or with a whizzy wand. Stir in the fish sauce - this gives it a really rounded out flavour, stopping the rhubarb being too astringent. Over the years the way I arrange flowers has changed - I used to create elaborate mixes of flowers, with lots of greenery and different types of flowers, designed to be displayed in a beautiful vase on a side table. Now things are much simpler, my time is more valuable and I am usually looking for something quick and effective. I find my arrangements have almost become deconstructed - the finished effect owing a lot to the nature table. 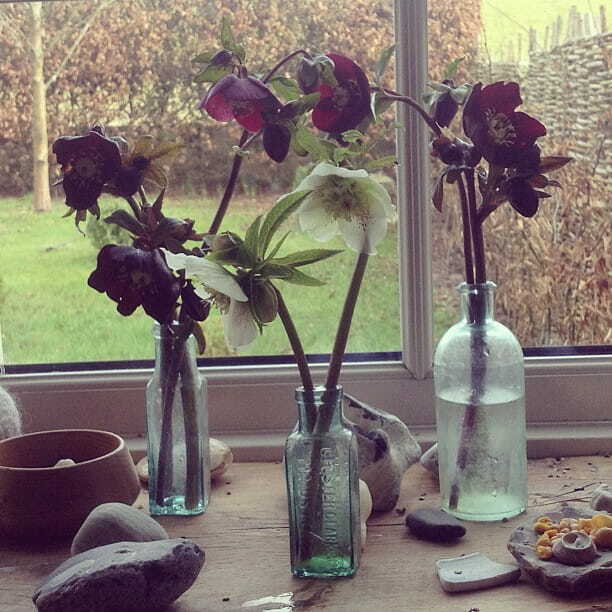 My favourite is on my bedroom windowsill - shells, fossils and stones gathered on family holidays are interspersed with old glass bottles, each with a single flower or stem in it. Each morning, as I sit in bed and drink my morning coffee, I wonder at how they change from day to day. To make a beautiful nature table you need. 1. A surface, while I say table I actually use a low bedroom windowsill at the moment. 2. Interesting semi permanent things to create a lower storey of interesting things - this is the ideal place or all those shells, stones and bits of sea glass that get brought back from beach combing walks. 3. Small glass containers - I use old Victorian bottles which you can pick up in antique shops or have a look at www.pedlars.co.uk in the vintage section. Old perfume bottles and small jars work well too. You want a selection of different sizes. 4. Things to put in your jars - twigs, flowers, seedheads. 5. If you are feeling particularly luxe add in some nightlights to put amongst your shells. Tips on what to pick. Now is the ideal time to snip twigs which will gradually open out into miniature leaves and blossoms. Lots of people do to with Forsythia but you can do it with almost any tree or shrub. Tiny bottles - old ink and medicine ones are the best - are the ideal way to show off miniature spring flowers - crocus, snowdrops, grape hyacinth. Later in the season you can cut those tiny side shoot flowers that get lost in the garden and display them in your bottles - my absolute favourite is Cosmos. Over winter I have a selection of seedheads - poppies, fennel and honesty - enjoying the low sun shining through their silhouettes. 1. Try not to site your table in direct sunshine - a north faint windowsill is fine but flowers will not last as long if it is south facing. 2. When you pick twigs sear the stem ends in boiling water for 10 seconds - this seems to shock them into taking up water efficiently. 3. Check water levels in your bottles each day - spring flowers especially are terribly thirsty. Snapdragon ceases to be a sole trader business and becomes a limited company - Snapdragon Online Ltd. In some ways nothing much will change - it is the same team, the same website, the same products - but in other ways it is a completely new chapter for us. Snapdragon began life as just me at my kitchen table, pootling around making things I liked, selling them through my blog and at craft fairs, opening up my garden and setting up a stall in my greenhouse. As Snapdragon grew, and it has grown much bigger than I had ever anticipated, I really struggled to keep up. I found it incredibly difficult to delegate, worked silly hours and on 24th December 2012, after a month of 16 hour days, I was exhausted and pretty fed up. Everyone else in my family was pretty fed up too. It was a turning point. Something had to change. So last year I began to completely restructure how we do things - new staff, new responsibilities, no more working ridiculous hours on things that other people in the team can actually do better than me . . . . .
And once I had changed the structure - well it suddenly seemed that Snapdragon should be more than a sole trader's business. And here we are in 2014 raring to go. Thank you for all your support - it makes all the difference to us. I love this time of year - all the spring bulbs start appearing - amazing detailed flowers that are wonderful to look at close to. Sometimes though it is really a bit too chilly to linger, crouched awkwardly in the flower beds and that is where this tip comes into its own. Bulbs - unlike other plants - are perfectly happy to be uprooted when they are about to flower - they have everything they need in the actual bulb so they will put up with some rough handling and less than ideal growing conditions for a while. This means that you can find a patch of bulbs in the garden, carefully dig them up and then cram them into a large cup, a sugar bowl or something else pretty. They won't care that there is no drainage for a couple of weeks. I think that they make the perfect, thoughtful gift for this time of year - dug from the garden they don't have the odd stiffness of commercially forced bulbs and it gives a chance to really appreciate the delicacy and detail of spring flowers. I love sketching them for my embroideries. Then, after they have finished flowering just plant them back in the garden, water well and they will be quite happy to bloom again next year. I used grape hyacinths and fritillaries but any small bulbs will work fine. These kinds of arrangements are also a fuss free, economical and gorgeous option for wedding flowers - just arrange bulbs in tea cups and group them as table flowers - then at the end of the day they can be given as gifts to bridesmaids, mothers of the bride and groom and other people who have helped with the day. Let me know what your favourite spring flowers are in the comments. Over the past few months my daughters have been keeping Tunnocks Caramel biscuit wrappers for me. I am really pleased with how they are turning out and have now sent them off to eat lots of tea cakes for the next pair of chairs . . .
On the subject of biscuits I found out that talented Scottish designer Nikki McWilliams has had her biscuit cushions ripped off by the wholesaler RJB Stone. and you can see the rip offs HERE - (as well as in lots of other shops where price matters more than quality). Tomorrow I head off down to London where I have a stand at the Trade Show Top Drawer in Earls Court. This is my opportunity to display what we do to thousands of potential buyers - gift shop and gallery owners, department store buyers, museum and heritage purchasing departments. For the past few months I have been mithering on, boring friends and family about my worries over where wholesale fits into the whole business. I kept working on the trade show stand but, if I am honest, my soul wasn't really in it. Last year we didn't really chase wholesale orders. The price of our wool, velvet, linen and lavender all went up again and again as world commodity prices soared; we made decisions to change our packaging to biodegradable corn starch instead of the cheaper cellophane and to get our badge and mirror components made in Europe rather than China. Each of these meant just an extra few pence on an item, but one after the other they mounted up and eroded our profit margin. Over the year we had to withdraw several ranges from our wholesale catalogue as we were actually making a loss on them. Then in the summer we had a clutch of our stockists go under, some leaving unpaid bills which had to be written off. Cash flow in retail shops seemed to get tighter and tighter and I got fed up with Valerie spending hours chasing up overdue invoices. I considered giving up wholesale completely and concentrating on the buoyant and blossoming retail side of the business. But then I thought of the joy that I have in developing ranges for some of our stockists - the blackbird cushions for Edwards and Todd, the intricate rigging of our Cutty Sark range, the cosy chintzy things I make for Dove Cottage. So the new samples mounted up on the table and this morning, as it looked like this outside, the fog in my head lifted and I suddenly saw exactly how the stand will look. Which is just as well with 24 hours to go before the only Trade show we do. For at Snapdragon we excel at bespoke and short runs of individual things - we have built up a way of working that allows us to customise, tweak and innovate at very little extra cost. In a world where everyone google searches before they buy this is a distinct advantage. And that is what I hope to convey on my stand. So if you happen to be visiting Top Drawer do come and see me on stand R60.